April 20, 2000. The date the Florida Panthers last played a postseason game. 11 years, 11 months, 17 days. 4,369 days ago. For fans of this franchise, it may as well have been a lifetime. So when Florida finally clinched a playoff berth last night despite losing to the Washington Capitals, you can forgive fans and players alike for not dwelling too much on how it happened, but only that it happened. If there has been a poster boy for the Panthers and their playoff drought, it’s been Stephen Weiss. 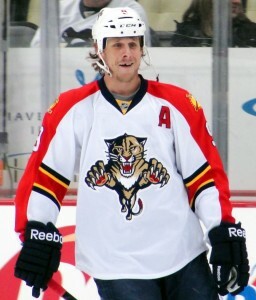 Drafted 4th overall by the Panthers in 2001, he’s been with Florida through the entirety. “It really hasn’t sunk in yet,” said Weiss. “I couldn’t care less how it happened.” After Saturday’s regular season finale, Weiss will have played in 637 NHL games, all with Florida, without a single postseason appearance. He was right up there with former Panthers Jay Bouwmeester and Olli Jokinen. But that will end next week. “It’s been tough… You go home early in the summer, and you wonder if you’re doing the right thing for yourself, for your career. You want to be loyal but you only get so many years to play. And you want to play playoff hockey and win a Stanley Cup… “It’s been a long 10 years. At the end of the day, it was worth staying. It was worth trusting Dale.” A tip of the cap to you, Stephen. There is still the small matter of deciding the division on Saturday. With the loss to Washington, Florida still needs a single point against the Carolina Hurricanes to claim their first division title in franchise history. Or should the Capitals lose to the New York Rangers, Florida would claim the 3rd seed regardless of their outcome. But whether the Panthers end up matched up against the 6th seed New Jersey Devils, or drop to 8th and play the top seed Rangers in the 1st round, it will end the longest playoff drought in NHL history and pass the torch on to the Toronto Maple Leafs. For Floridians and Panther fans that have heard so much griping and whining and belittling from our great neighbors to the north, there may be just a smidgen of guilty pleasure in that as well. So when the “experts” all point to the Panthers backing into the playoffs, losing in 8 of their last 9 games (although gaining a point in 5 of those losses), don’t tell that to the Panthers. Don’t tell that to their fans who’ve been waiting over a decade. Is Florida the “the worst team that will make the final sixteen since the lockout”? Maybe. But who cares. Just ask the 7-9 Seattle Seahawks who made the NFL postseason in 2011 and went on to shock the Super Bowl favorite New Orleans Saints. Just ask the 2010 8th seed Montreal Canadiens, who entered the playoffs with a negative goal differential, only 88 points, and won just 3 of their final 10 games of the season and yet managed to find their way to the conference finals. Or ask the 2006 Edmonton Oilers, who got in as the 8th seed and would up playing a Game 7 in the Stanley Cup Finals. While fans probably won’t admit to being happy to see their team swept in first round, even having just those 4 playoff games will mean more to this franchise and to this fan base than anyone outside of the Panther family could understand. We’ll have much more on the Panthers in the playoffs once the season concludes this weekend. But for now, enjoy this. I know I am.